Business owners in drought-stricken California and thirsty regions throughout the country are searching for ways to stay in business and reduce their water use, especially those that rely on water for operations. Businesses such as car washes are easy targets of “save water” campaigners. However, today’s modern in-bay automatic, express, or full-service car washes leave a smaller environmental footprint overall than their older, antiquated counterparts. Here’s how a few fixes, some costly and some less so, can save you thousands of dollars in operations and leave you feeling good about your environmental legacy. Many states and communities throughout the West and in some other regions of the country rely on hydroelectric power — i.e., using water to generate electricity. Some hydroelectric power plants actually own their own dam-reservoir system and send excess water downstream. Others, as in California and Nevada, draw from the same source, Lake Mead, which is fed by the Colorado River and powered by the Hoover Dam. Hydroelectric power users like Nevada Energy and the Los Angeles Department of Water and Power are the region’s biggest water users, by a whole lot. So it stands to reason, reduce energy consumption and reduce power bills. If everyone turned off their lights, television sets, and powered down computers, residential customers would see a reduction in their power bill. Businesses, like car washes, can look at similar ways to reduce their energy consumption, thus lowering their costs. In Hermosa Beach, CA, Chris McKenna, owner of the Rock n’ Roll Car Wash, converted his brush packs and conveyor belts from hydraulics to electric motors several years ago. McKenna says he can’t imagine why anyone is still using hydraulics. “Hydraulic motors that use hoses to send hot, pressurized oil across the tunnels and over cars are bad for the environment and will create a huge mess if the hoses or connections ever break, not to mention the liability implications,” says McKenna. “We converted to electric motors and we now have a cleaner, more efficient, maintenance-free operation that is saving us 40 percent on energy costs.” McKenna’s full-service car wash cleans 5,000 cars per month. Bubbles rinse off easier than foam. Ennis says that electric motors have been improved over the years. The original thinking was that electric motors weren’t good in a water environment. The risk of electric shock was just too great, which lead to the popularity of hydraulics. However, he says, current technology that uses waterproof cords, is more reliable, easier to maintain, and uses a lot less power. He says some locations have been washing up to 2 million cars on one electric motor. “Hydraulic systems that run hot, pressurized oil at 800 to 1,100 PSI through hoses to the hydraulic motors are, in most cases, a malfunction waiting to happen,” explains Ennis. Speaking of power, the power needed to dry a car can be reduced by simply shortening the distance from the car to the blower nozzle, adds Ennis. And it’s quieter, too, reducing noise pollution. Nathan Lim, co-partner of Blue Wave Car Wash in Los Angeles’ Korea Town, was getting complaints from neighboring commercial businesses about the noise caused by the blowers in his establishment. He went shopping for a quieter option and found what he needed. “Our old dryer was running at 90 HP and was very noisy. The new ‘squeegee’ system gets the nozzle 2 inches from the vehicle surface, uses two 7.5 HP motors and the noise level is only 84 decibels at 10 feet,” Lim says. 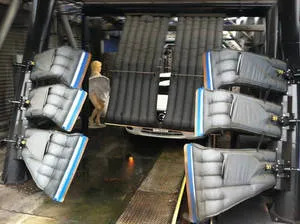 The system not only is quieter, but it is a much more efficient drying system, incorporating a soft polyurethane material that is used by professional detailers to dry vehicles. “Our power bill has been reduced from $5,000 to less than $3,000,” he adds. Lim says he made the change about three months ago and there have been no more complaints from neighbors about noise — and his employees are happy. Lim washes about 400 cars a day, 12,000 per month. Once a “foamer,” McKenna now washes cars with bubbles and he has seen water use drop 20 percent to 30 percent. “Bubbles definitely clean better and rinse off easier with a lot less water,” says McKenna. NS Wash System’s Ennis explains that bubbles drop off and rinse off much faster than foam systems. 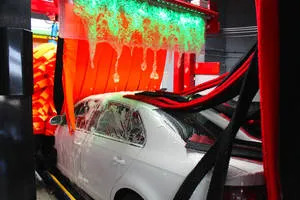 “Foam is a thick concentrate and it takes a lot more water to rinse a car clean.” Ennis says that car washes with foam systems can adapt to a soap application system or change the concentrate of the foam to make it thinner and easier to rinse. Adapted systems or bubbles should reduce the amount of water by 30 percent, to about 21 gallons per car. Another easy fix, part of routine maintenance, is to replace nozzles at least every three to four years. Over time, water going through the nozzles creates wear, making the holes get bigger. Replacing the nozzles will reduce water use by 30 percent to 40 percent. However, this is something that car wash operators rarely do. Finally, reusing and reclaiming water is the oldest and best way to reduce water use. Car washes are required to have a clarifier system to separate dirt from the oil before the water enters the sewer system or storm drains. All car washes have underground clarifiers, which are used in the reclaim system to satisfy city codes, yet can leak and contaminate the soil. Also, they are sometimes turned off after inspection due to poor smelly water. They have a “rotten egg” odor, harbor bacteria, and require constant maintenance. Underground systems also cost several thousands of dollars to be pumped. Aboveground systems are easier to maintain, can be cleaned by staff, and leaks, if any, can be spotted and dealt withimmediately. According to Ennis, underground systems can be converted to an aboveground reclaim system. 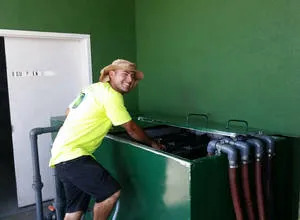 Aboveground reclaim systems recycle all the water used in the car wash and send excess water into the underground clarifier system and then to the sewer. By reducing energy consumption, reusing and recycling water, and changing from foam to bubbles, car wash owners and operators can leave a smaller environmental footprint and improve their bottom line. Sydney Sullivan Knott is the owner of The PR Group, a full-service Las Vegas-based public relations firm, specializing in business-to-business public relations.